[Update 2]: Gears of War 2 confirmed: Due as early as October! The press release has leaked early. The announcement due at the end of the Microsoft GDC Keynote (happening as I write). What you’re not gonna hear in the press papers? CliffyB has been strangely very hands off this time around. You didn’t hear it from us. The GoW 2 video played at GDC, and as Joystiq described it: CliffyB burst in and leaves us with a quick piece of info. Gears 2 in November 2008, only on Xbox 360. MajorNelson’s Flickr has some fun pictures of he and CliffyB playing with the fun Lancer of Cliff’s. Major also tells us to watch XBLM for a trailer of GoW2 later today! Still don’t know what’s behind the XNA curtain. Posted in GamingTagged games, GDC, XBLM1 Comment on [Update 2]: Gears of War 2 confirmed: Due as early as October! The above picture is from Kotaku, and, in the distance, it shows a mysterious shrouded stand, in the middle of the Microsoft XNA lobby, at GDC. We aren’t there, we don’t know what it is, either. But there is something behind that curtain – and it is scheduled to be unveiled in about an hour. The teams at WinBreak Central Command and WinBreak Remote Command are all geared up and ready to blog. Of course, I’m a one man show, but I have my own tool set to try and get this news to you as soon as it breaks to the public. It’s hard to imagine something to do with XNA is going to steal the show, after all, the Creators Club has so far failed to produce the amazing results we thought it would in 2006. But there is something that Microsoft has deemed interesting enough to hype up a little bit, and leave to the imagination, so here’s hoping! More than likely, whatever the surprise announcement is, it will be featured on Inside Xbox, Major Nelson, and Gamerscore Blog. Community made XNA games will be distributed through Xbox Live. Many games will be playable on Zune. 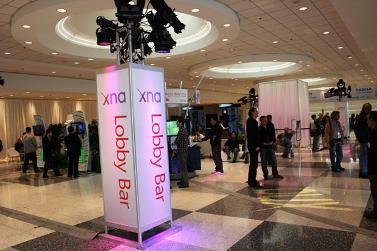 Windows – Xbox – Zune all expected to be ‘cross platform’-ish with XNA. But behind the curtain? Is it a GoW 2 display? Screenies of all of the XNA games supposedly available on the XBLM? We don’t know yet… but we do know the GoW2 video is playing at this very instant at GDC. UPDATE 2: Kotaku has presented us with pictures of “the stand behind the curtain.” Just as I (sort of) guessed, it is a demo station featuring the announced XNA games. Also, interestingly, a link to XNA Game Studio Connect at the bottom – must be the one that goes directly to your PC? Don’t know, I didn’t play around enough with XNA last year when I was playing around with it at all… but I’m sure there will be clearer details to come this week.